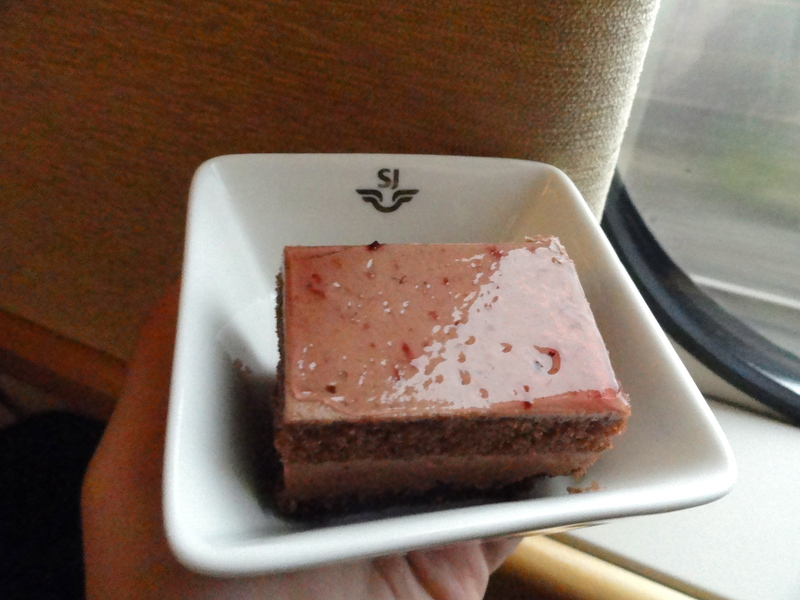 Judging by the common complaints against the Swedish state train services (SJ) – the constant delays and breakdowns, the high prices, and the 50 years of overdue track repairs – I never expected much of their food. But given SJ’s weird booking system, I recently came across a first class ticket between Lund-Nässjö which oddly was cheaper than a 2nd class ticket. 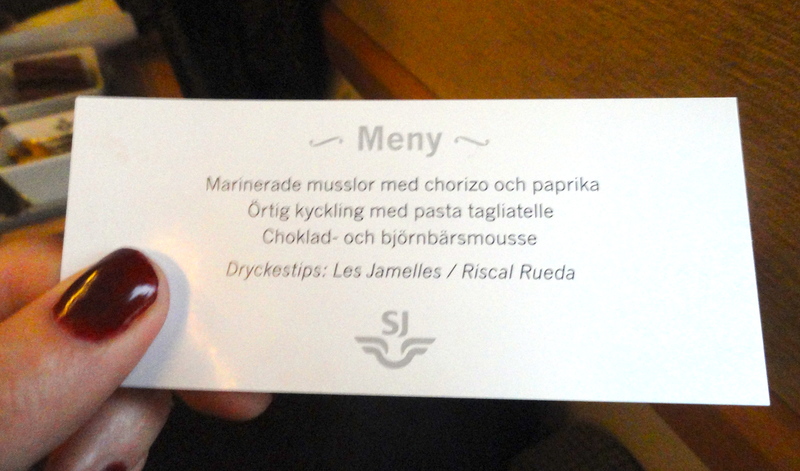 Having saved 100 kronor by travelling first class, I opted for the “Three Course Menu” for 145 Swedish kronor (appox. 16 euros) with quite some excitement. 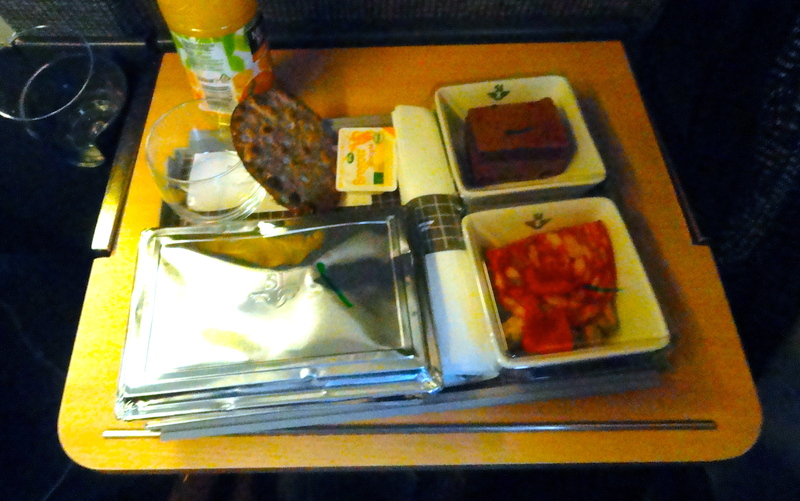 Having rolled out of a rainy Lund with only 1h 30 to eat, I was delighted that the food arrived promptly after 20 minutes. It was so hot that I burnt my finger, and the entire meal was presented on a tray like airplane food. The heavy china with the SJ logo on was a nice touch, as well as the little note presenting the food. But my optimism was slightly quashed by the first forkful. 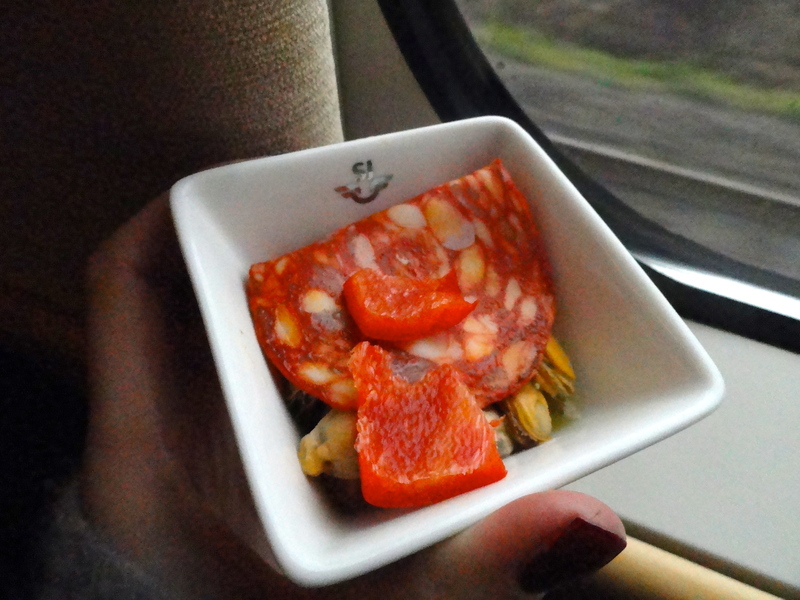 The ‘starter’ consisted of marinated mussles with a slice of chorizo and some chopped red pepper. They were marinated in something tangy, but had a fishy aftertaste, and I set my hopes higher for the next dish. The ‘main’ was, unfortunately, a slight downward ride from the mussels. Of course, it was foolish of me to get my hopes up for something blandly described as “Herby chicken with tagliatelle”. 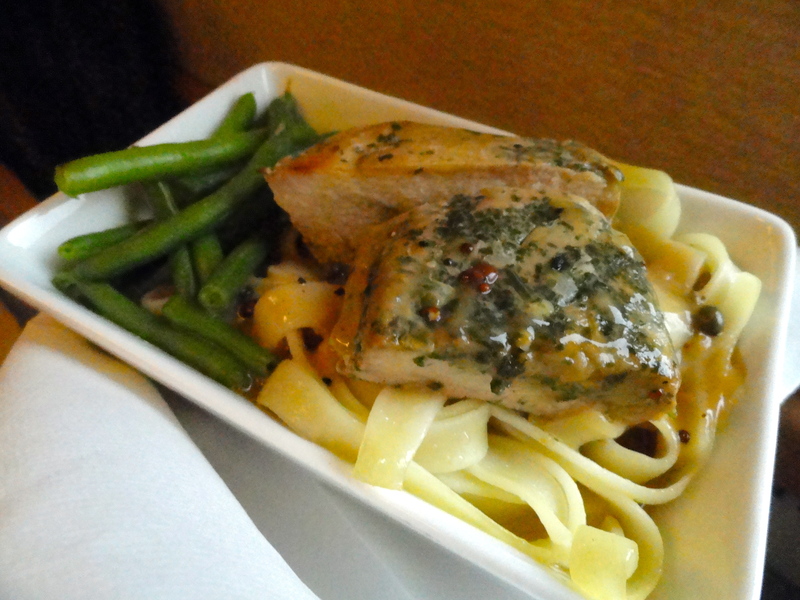 The chicken was hot, which was good, but rubbery at places, and the tagliatelle was overcooked. The most troubling part was the sauce, which was so thin that it kept splashing across to my fellow passenger (whom I didn’t know, and probably wasn’t appreciating my eager food analysis). The dessert, a “Chocolate and blueberry mousse”, looked cute, but sounded like a combo that would be weird even in the poshest restaurant. Luckily, the promised fusion didn’t actually materialise – instead it tasted like soft chocolate sponge cake with some tangy chocolate mousse on top. It was decent. All in all, the SJ lunch tasted much like airplane food, which I suppose is what you should expect given the price, the setting, and the standard of SJ services. So nothing terrible, yet not quite worthy of the lush “3 course menu” description on their website, or their elegant wine suggestions to go with it. I imagine it’s a lifetime of difference from the food on the Orient Express, where a single trip from Paris to Istanbul sets you back almost €7000. I long for trying it. 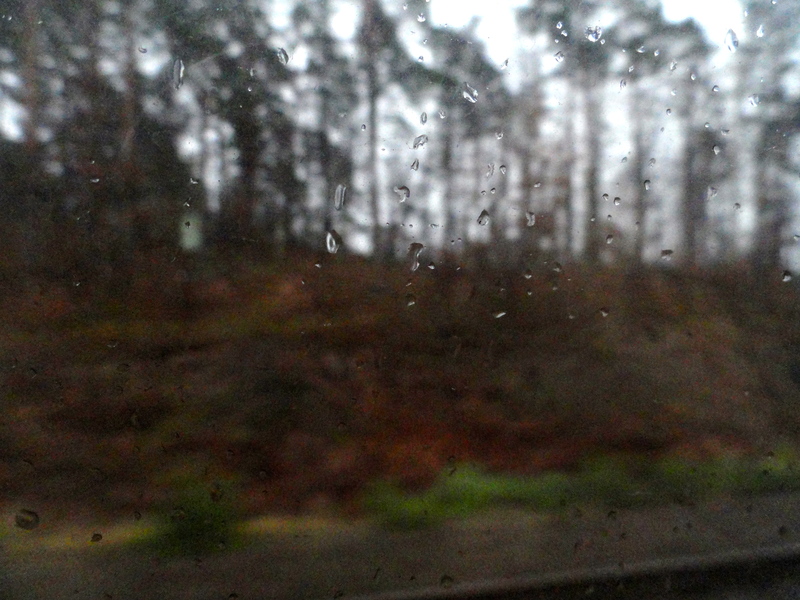 Until then, I leave you with a wet photo of the Swedish countryside, to match the SJ gastronomic experience.